If you are one of those people who prefers a physical keyboard with your iPhone or smartphone then you may want to check out this new miniature Bluetooth keyboard. 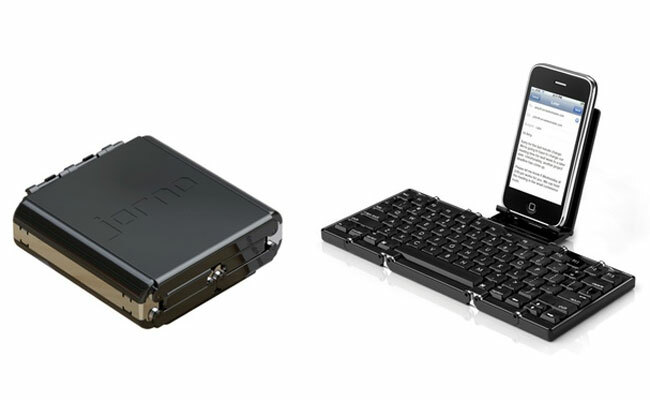 The Jorno pocket sized keyboard looks quite handy as it can be folded up and slipped in your pocket, and measures 3.5 inches by 3.5 inches by 0.9 inches when it is folded away. Once it has been unfolded it measures 8.5 inches by 3.5 inches by just 0.3 inches thick, and it weighs in at just 8.8 ounces. It features a rechargeable li-ion battery that will reportedly give you up to one months usage. If you want one the Jorno pocket Bluetooth keyboard is available to pre-order for $79.